Francis John Jacobs (known as John or Jack) was born in Headington in 1898, the son of Joseph Jacobs (born in Headington in 1859) and Caroline Anne Draper (born in Headington in 1859/60). Robert Hector Jacobs (born in New Headington on 22 April 1900 and baptised at St Andrew’s Church on 8 July). In the 1881 census Jack's parents are listed in New High Street: his father Joseph (22), who had been a labourer at the time of his marriage, was a Sergeant of the Oxfordshire Militia, and his mother Caroline (19), who is wrongly recorded as Charlotte, was a dressmaker. Their first two children lived with them: Carrie (2) and Lily (six months). By the time of the 1891 census Jack’s father Joseph (32) was a general labourer, still living at New High Street (possibly at No. 56) with Caroline (31), who was now a self-employed laundress working from her home, and their first four children Albert (8), Harold (5), Walter (2), and Sidney (five months). Jack himself first appears in the 1901 census. Aged just two, he was still living in New High Street (probably at No. 26) with his father Joseph (42), who was now a plasterer, his mother Caroline (41), who was still a laundress, and his siblings Carrie (22), Harold (15), who was a plumber's mate, and Walter (12), Sidney (10), Josephine (5), and Robert (eleven months). Frank's mother was also bringing up as her own child Alan Jones Jacobs (2), her daughter Carrie's illegitimate son, who was born on 1 May 1898 and baptised at St Andrew’s Church on 26 June; he died at the age of six and was buried at Headington Cemetery on 2 April 1905. In 1910 New High Street was taken out of St Andrew's parish into the new parish of All Saints. At the time of the 1911 census Jack (12) was at school (almost certainly Headington National School) and living at New High Street with his father Joseph (52), who was a plasterer, and his mother Caroline (51), recorded as Annie, who was working as a laundress on her own account at home. Four of his siblings were still at home: Walter (22), who was a groom/gardener; Sidney (20), who was a gardener; and Josephine (15) and Robert (10). Jack’s eldest sister Carrie Jacobs died in Headington Workhouse in 1916 at the age of 37 and was buried in Headington Cemetery on 17 April. 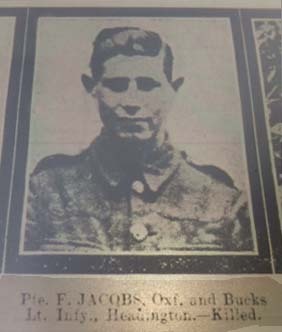 In the First World War Francis John Jacobs (Jack) served as a Private in the 1st/4th Battalion of the Oxfordshire & Buckinghamshire Light Infantry (Service No. 201602). He was killed in action in Belgium at the Third Battle of Ypres (Passchendaele) aged 19 on 7 August 1917. 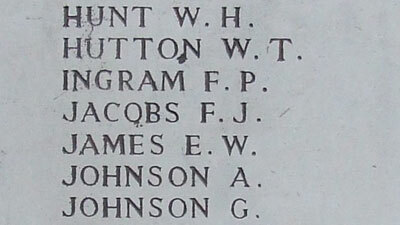 He has no known grave, but is remembered on the Ypres (Menin Gate) Memorial. The photograph of his name on that memorial (right) was kindly supplied by British War Graves. 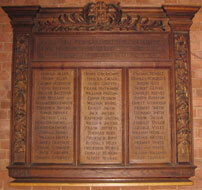 Francis John Jacobs is also remembered on the Roll of Honour of All Saints’ Church, Highfield. They lived at 26 New High Street just after his death. Mrs Caroline Jacobs died at the London Road Hospital (the former workhouse) at the age of 76 and was buried at Headington Cemetery on 17 July 1936. Joseph Jacobs was still working as a plasterer when he died on 15 December 1937 at 29 Kennett Road (then “New Road”) at the age of 79.